We organised three comprehensive trips which could easily be slotted into a week’s holiday in Cairns. We figured three full days of exploring would be enough to break the monotony of lazing around the pool/on the beach, reading or chatting or snoozing, exploring the area on our rented bikes, sipping beers or cocktails at sunset, and generally relaxing which is, after all, what holidays are for. But you can have too much of a good thing and it would be a shame to fly 4 hours north and not see some of the sights. If you are easily bored, by all means there are more trips on offer to keep you busy 24 hours a day and you could easily fit more activities and trips into a week’s stay but with that comes the problem of cost and we found this itinerary fitted us perfectly. These are the trips we selected, in no particular order, which we felt meant we saw a bit of everything Cairns had to offer. No trip to Queensland would be complete without a boat trip out to the most famous reef in the world. This trip took place before I learned to dive but I was still looking forward to snorkelling. After much research we booked a trip on a small boat which took a maximum of about 20 people. Most of the tour companies run huge boats which carry literally hundreds of tourists. You snorkel in teams of about a dozen people and in shifts organised with military precision. It must be like swimming around in human soup and this did not appeal at all. We hoped to see lots of fish not lots of people. The company we booked with cost just a fraction more than the large companies and it was worth every single cent. We made our own way down to the harbour on the morning of the trip and boarded our catamaran. There were a mixture of divers and snorkelers and a good mix of age groups and nationalities. The crew were Irish and seemed passionate about the ocean. It was a relaxed atmosphere and we settled down to the hour long journey to a Ulopu Reef. 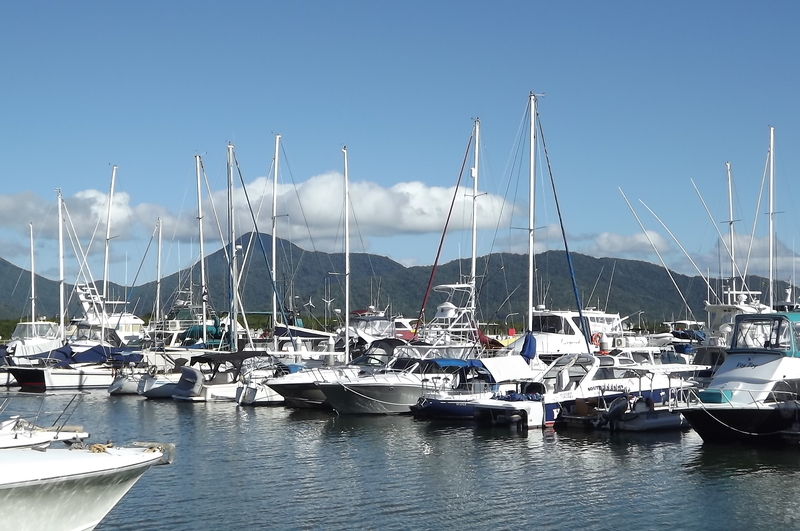 The chaos of Cairns Harbour was quickly left behind as we headed to the outer reef and when we arrived at the first spot although we could make out a few vessels on the horizon we pretty much felt that we had the place to ourselves. Stingers suits (basically a pair of tights for your whole body) were offered as an option (it being stinger season and all) but we were advised that we should be pretty safe as these nasty little critters generally cling to the shoreline and are rarely encountered as far out at sea as we were. So we took our chances. The engines stopped and we dropped anchor and the lovely sound descended of the sea lapping the sides of the boat and not a lot else. The divers geared up while the snorkelers donned masks and clasped their fins and jumped overboard from the back of the boat. We had been promised huge batfish and sure enough, after not very long at all at all, there were a few hanging around at the back of the boat. I hired an underwater camera to take some shots to show the Wooky how it compared with Cambodia and Indonesia although my photography skills are no better underwater than they are on land. I must admit to being a tiny bit disappointed but I think the hype of the Great Barrier Reef was part of the reason for this. Places like Cambodia, Vietnam and Indonesia are slated for destroying huge swathes of coral reef by dynamite fishing but increasingly, as governments are educated about the harm this does and the importance of the reefs to fish stocks and tourism, steps are being taken by those countries to try and put a stop to this practice and we were fortunate enough to have visited places untouched by dynamite and others where dynamiting had been stopped and the reef was starting to recover. Rumours abound that the Great Barrier Reef is adversely affected by bleaching and I instantly recognised what this meant. In places the coral appeared washed out and the fish population seems a bit scarce in places. Had this been the first place I had ever snorkelled I would have been impressed but it had a lot to live up to. Taking the time explore this small part of the reef did reap rewards and there were areas of coral that were visibly healthier than others, and schools of fish appeared every now and again. A couple of turtle sightings made my day but I was disappointed that I could not locate a clown fish. I did spot a titan triggerfish which seemed quite friendly (for a triggerfish). I hesitate to mention my disappointment because the sheer size and scale of the Great Barrier Reef cannot be underestimated and we only visited a tiny part. There are apparently areas which remain pristine although they are likely to be more difficult and expensive to access. Furthermore a snorkeler’s view from the water’s surface is particularly one dimensional and a diver would be better placed to provide a more balanced view. But this was my experience and despite being a tad disappointed it was amazing to be back in the water and Suzi loved it. All in all, it was a great day, very relaxing, professionally organised and far preferable to being herded around on one those enormous boats with 300 other people. Daintree Rainforest provides a certain contrast to coastal Queensland and it is one of the reasons we opted for northern Queensland. We decided that joining a tour would be the best way to get an overview of the Daintree and we selected a Billy Tea tour which also took us north to Port Douglas and Cape Tribulation and beyond. The tour started early and included a breakfast/coffee stop in Port Douglas, a cruise along an apparently crocodile infested river (a small one was spotted basking on the riverbank, allegedly, but not by me), we had an amazing barbecue lunch at an animal sanctuary where we hand fed wallabies and kangaroos and saw an amazing array of parrots up close and personal. We travelled off road to an isolated freshwater creek where swimming was optional (I opted out – crocodiles), and our guide prepared tropical fruit for tasting and tea in a traditional billy can. The main walk through the rainforest was an easy hour or so on a boarded walkway to cater for people young and old and varying levels of fitness. Our guide and driver, Fin, was incredibly knowledgeable and passionate about the Daintree and north Queensland in general. He explained the life cycle of the forest, the wildlife that makes it home and pointed out lots of birds and a couple of lizards. During our rainforest walk we even saw an endangered cassowary with its chick and they both seemed oblivious to us as they rummaged around on the forest floor for tasty insects. We also stopped off for a wander along the beach at Cape Tribulation, a stunning bay and well worth the trip. It is at this point that the rainforest meets the ocean and there is another boarded walkway that through the forest at this location. There were also some impressive spiders lurking in equally impressive webs suspended over the entrance to the bathroom facilities. Slightly disconcerting, it being Australia where almost all the wildlife is deadly. Fin was equally passionate about the history of this part of the world and was particularly keen to share this knowledge with us. He gave us a potted history of the sugar cane industry, how vital it was to the country’s economy and how south sea islanders were cruelly exploited by the industry. Crews of men were sent to the south sea islands and used varying tactics to encourage islanders to travel to work in the cane fields although there are many reports of coercion and kidnapping. It really was Australia’s slave trade and is largely brushed over and forgotten about. Fin also had enormous respect for the Aboriginal community and bowed to their unrivalled knowledge of the landscape and the natural world in these parts. Overall, Fin’s enthusiasm knew no bounds and was highly infectious although he did like a good conspiracy theory. Suzi and I were sat in the front seats on the minibus and for the most part he provided a running commentary via a microphone to the tour group as we drove from place to place. However, every now and again he would turn off the microphone and address us in a conspiratorial manner to share some snippet of borderline paranoia with only us. I don’t know whether that was more worrying or the fact that he thought we were the type of people who were likely to agree with him. All in all, that part of the trip was pretty unusual but quite entertaining and not entirely unpleasant. A cruise along a crocodile infested river. We saw no crocodiles. By his own admission Fin could talk the hind legs off a donkey or, as he put it, he could talk under 6 feet of cement with a mouth full of marbles, and he really was one of the main reasons the trip was so memorable and enjoyable. We went with Billy Tea Safaris. Kuranda is a village in the middle of the rainforest and a host to many tourist attractions including souvenir shops and art galleries selling indigenous crafts, markets, restaurants and cafes: it even has a zoo but the main attraction of Kuranda is getting up there and getting back down again. 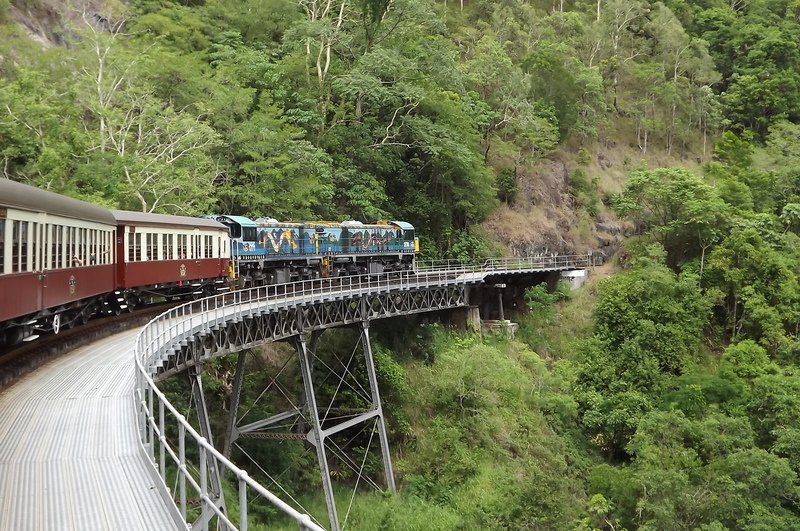 We chose to travel up to Kuranda on the Scenic Railway and return via the Skyrail Rainforest Cablecar. it is possible to drive up or there are public transport options but really, the only reason we visited was to ride on the train and the cablecar. We loved the train. The journey takes about 1 hour 45 minutes and you pass through some amazing rainforest scenery, past waterfalls, across bridges and through tunnels. I even saw another cassowary legging it into the undergrowth from the platform at the station we stopped at half way to disembark and take photographs from a particularly scenic vantage point over Barron Falls. The history of the railway is impressive in itself and there is an on board video explaining this throughout the journey. The railway was built between 1882 and 1891 by a workforce of mainly Irish immigrants and at that time was considered an engineering feat of enormous magnitude. Along 34 kilometres of track it rises from sea level to 328 metres, and comprises 15 hand dug tunnels and 37 bridges. It was originally built to transport provisions to tin miners working at mines in the hills who were on the verge of starvation as the roads became impassable in the wet season. Many workers died during the construction as a result of accidents and poor working and living conditions; possibly hundreds of men died but the true number is unknown. The train carriages are authentic, made of wood with open windows to allow a breeze. The journey is slow and it was one of the highlights of our trip as we wound our way up the hill towards Kuranda with amazing views all the way down to the coast. Kuranda Station is set in pretty tropical gardens and Kuranda itself is attractive with some old (late 19th century) buildings and a bit of character. Once we arrived we wandered around for a bit and into the various souvenir shops. We stopped for something to eat at a bar at the top of the village and encountered some of the locals who were friendly enough. After a while we set out to catch our cablecar back down to the coast. Bearing in mind that I am absolutely terrified of heights I think I was very brave (an idiot) for getting into the cablecar in the first place and secondly, for not screaming blue murder when I realised the car had a glass bottom. As it turned out, because the cable passed a few metres above the canopy of the rainforest you have a sense of not actually being as high as you really are and I wasn’t that terrified. It’s also generally less terrifying going down than it is going up so that helped. Once again, the views across the top of the rainforest and down to the coast were incredible. There are a couple of stops on the way down so you can exit your car, wander around for a bit, take a few pictures and then catch the next car down to the next stop. All in all it was a rather fun day out. All these trips were good value for money and after a week in northern Queensland we felt we had seen a fair snapshot of the area while still able to devote a considerable chunk of our time just chilling.